This tutorial provides a step-by-step example to use Confluent Schema Registry. It walks through the steps to enable client applications to read and write Avro data with compatibility checks as schemas evolve. Kafka producers write data to Kafka topics and Kafka consumers read data from Kafka topics. There is an implicit "contract" that producers write data with a schema that can be read by consumers, even as producers and consumers evolve their schemas. Confluent Schema Registry helps ensure that this contract is met with compatibility checks. It is useful to think about schemas as APIs. Applications depend on APIs and expect any changes made to APIs are still compatible and applications can still run. Similarly, streaming applications depend on schemas and expect any changes made to schemas are still compatible and they can still run. Schema evolution requires compatibility checks to ensure that the producer-consumer contract is not broken. This is where Confluent Schema Registry helps: it provides centralized schema management and compatibility checks as schemas evolve. The target audience is a developer writing Kafka streaming applications who wants to build a robust application leveraging Avro data and Confluent Schema Registry. The principles in this tutorial apply to any Kafka client that interacts with Schema Registry. This tutorial is not meant to cover the operational aspects of running the Schema Registry service. For production deployments of Confluent Schema Registry, refer to Schema Registry Operations. Use the Confluent Platform Quick Start to bring up Confluent Platform. With a single-line command, you can have a basic Kafka cluster with Confluent Schema Registry and other services running on your local machine. Clone the Confluent Platform examples repo from GitHub and work in the clients/avro/ subdirectory, which provides the sample code you will compile and run in this tutorial. First let us levelset on terminology: what is a topic versus a schema versus a subject . A Kafka topic contains messages, and each message is a key-value pair. Either the message key or the message value, or both, can be serialized as Avro. A schema defines the structure of the Avro data format. The Kafka topic name can be independent of the schema name. Schema Registry defines a scope in which schemas can evolve, and that scope is the subject . The name of the subject depends on the configured subject name strategy, which by default is set to derive subject name from topic name. As a practical example, let's say a retail business is streaming transactions in a Kafka topic called transactions . A producer is writing data with a schema Payment to that Kafka topic transactions . If the producer is serializing the message value as Avro, then Schema Registry has a subject called transactions-value . If the producer is also serializing the message key as Avro, Schema Registry would have a subject called transactions-key , but for simplicity, in this tutorial consider only the message value. That Schema Registry subject transactions-value has at least one schema called Payment . The subject transactions-value defines the scope in which schemas for that subject can evolve and Schema Registry does compatibility checking within this scope. 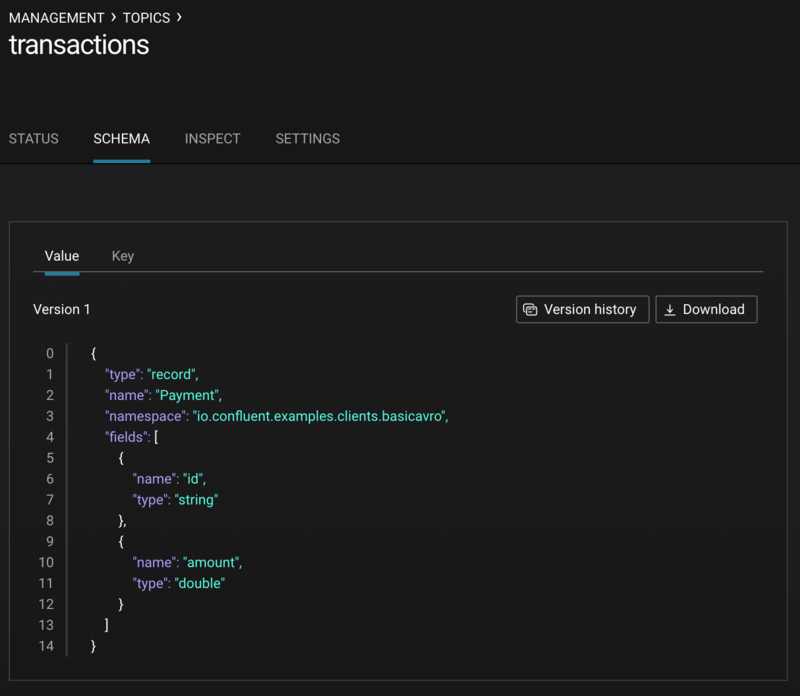 In this scenario, if developers evolve the schema Payment and produce new messages to the topic transactions , Schema Registry checks that those newly evolved schemas are compatible with older schemas in the subject transactions-value and adds those new schemas to the subject. The first thing developers need to do is agree on a basic schema for data. Client applications form a contract: producers will write data in a schema and consumers will be able to read that data. fields: one or more simple or complex data types for a record. The first field in this record is called id , and it is of type string . The second field in this record is called amount , and it is of type double . For a full pom.xml example, refer to this pom.xml. There are two basic types of Avro records that your application can use: a specific code-generated class or a generic record. The examples in this tutorial demonstrate how to use the specific Payment class. Using a specific code-generated class requires you to define and compile a Java class for your schema, but it easier to work with in your code. However, in other scenarios where you need to work dynamically with data of any type and do not have Java classes for your record types, use GenericRecord. For a full Java producer example, refer to the producer example. Because the pom.xml includes avro-maven-plugin, the Payment class is automatically generated during compile. To run this producer, first compile the project and then run ProducerExample. For a full Java consumer example, refer to the consumer example. Because the pom.xml includes avro-maven-plugin, the Payment class is automatically generated during compile. To run this consumer, first compile the project and then run ConsumerExample (assuming you already ran the ProducerExample above). At this point, you have producers serializing Avro data and consumers deserializing Avro data. The producers are registering schemas and consumers are retrieving schemas. You can view subjects and associated schemas via the REST endpoint in Schema Registry. $ curl --silent -X GET http://localhost:8081/subjects/ | jq . $ curl --silent -X GET http://localhost:8081/subjects/transactions-value/versions/latest | jq . The schema is identical to the schema file defined for Java client applications. Notice in the output above, the schema is escaped JSON, i.e., the double quotes are preceded with backslashes. $ curl --silent -X GET http://localhost:8081/schemas/ids/1 | jq . Integration with Confluent Schema Registry means that Kafka messages do not need to be written with the entire Avro schema. Instead, Kafka messages are written with the schema id. The producers writing the messages and the consumers reading the messages must be using the same Schema Registry to get the same mapping between a schema and schema id. In this example, a producer sends the new schema for Payments to Schema Registry. Schema Registry registers this schema Payments to the subject transactions-value , and returns the schema id of 1 to the producer. The producer caches this mapping between the schema and schema id for subsequent message writes, so it only contacts Schema Registry on the first schema write. When a consumer reads this data, it sees the Avro schema id of 1 and sends a schema request to Schema Registry. Schema Registry retrieves the schema associated to schema id 1 , and returns the schema to the consumer. The consumer caches this mapping between the schema and schema id for subsequent message reads, so it only contacts Schema Registry the on first schema id read. By default, client applications automatically register new schemas. If they produce new messages to a new topic, then they will automatically try to register new schemas. This is very convenient in development environments, but in production environments we recommend that client applications do not automatically register new schemas. Register schemas outside of the client application to control when schemas are registered with Confluent Schema Registry and how they evolve. Within the application, disable automatic schema registration by setting the configuration parameter auto.register.schemas=false , as shown in the examples below. To manually register the schema outside of the application, send the schema to Schema Registry and associate it with a subject, in this case transactions-value . It returns a schema id of 1 . So far in this tutorial, you have seen the benefit of Confluent Schema Registry as being centralized schema management that enables client applications to register and retrieve globally unique schema ids. The main value of Schema Registry, however, is in enabling schema evolution. Similar to how APIs evolve and need to be compatible for all applications that rely on old and new versions of the API, schemas also evolve and likewise need to be compatible for all applications that rely on old and new versions of a schema. This schema evolution is a natural behavior of how applications and data develop over time. Confluent Schema Registry allows for schema evolution and provides compatibility checks to ensure that the contract between producers and consumers is not broken. This allows producers and consumers to update independently and evolve their schemas independently, with assurances that they can read new and legacy data. This is especially important in Kafka because producers and consumers are decoupled applications that are sometimes developed by different teams. By default, Schema Registry is configured for BACKWARD compatibility. You can change this globally or per subject, but for the remainder of this tutorial, leave the default compatibility level to backward . Schema Registry checks compatibility as schemas evolve to uphold the producer-consumer contract. Without Schema Registry checking compatibility, your applications could potentially break on schema changes. Before proceeding, think about whether this schema is backward compatible. Specifically, ask yourself whether a consumer can use this new schema to read data written by producers using the older schema without the region field? The answer is no. Consumers will fail reading data with the older schema because the older data does not have the region field, therefore this schema is not backward compatible. Confluent provides a Schema Registry Maven Plugin, which you can use to check compatibility in development or integrate into your CI/CD pipeline. Our sample pom.xml includes this plugin to enable compatibility checks. You could have also just tried to register the new schema Payment2a manually to Schema Registry, which is a useful way for non-Java clients to check compatibility. As expected, Schema Registry rejects it with an error message that it is incompatible. You can try registering the new schema Payment2b directly, and it succeeds.